Billy Bloom (Alex Lawther) is one-of-a-kind: a fabulous, glitter-bedecked, gender-bending teenager whose razor-sharp wit is matched only his by his outrageous, anything-goes fashion sense. When his glamorous mother (Bette Midler) is to send him to live with his straight-laced father (Larry Pine), Billy finds himself a diva-out-of-water at his new ultra-conservative high school. Undaunted by the bullies who don't understand him, the fearless Billy sets out to make a big statement in his own inimitable way: challenging the school's reigning mean girl (Abigail Breslin) for the title of homecoming queen. This proudly offbeat comedy is an irresistible ode to outsiders and nonconformists of all stripes. Freak Show is one of the most inspiring and entertaining gay movies so far this year - featuring Alex Lawther's absolute best performances yet (despite his young age, has a resume full of great ones. The film was adapted from the bestselling novel by the iconic James St. James and directed by the Fabulous Trudie Styler (Sting's wife, sure, but she's more than just that). The cast is packed with great actors, including Bette Midler in a fantastic off-the-wall performance. Even tennis legend John Mcenroe is terrific as les-than-supportive gym coach. Bravos all around... well except for one teensy weensy casting flaw... I can't believe a chubby teen-aged girl would EVER be a serious contender for home coming queen. The ham handed religiosity was also off-putting. But I guess it was necessary to help us understand the un-fabulous societal wilderness in which poor Billy Bloom finds himself. I'm still pondering whether or not turning Bette Midler into a character you wind up hating is a mortal or venial sin for a gay movie.... That being said - definitely a worthwhile watch! 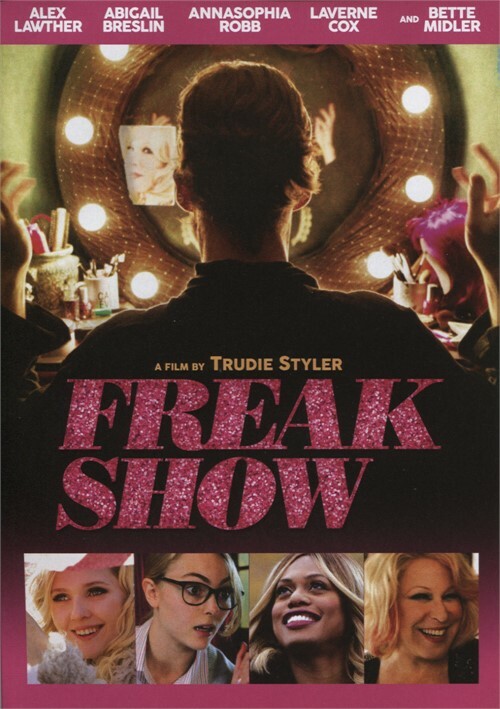 Trudie Styler's "Freak Show" is about teen Billy Bloom (Alex Lawther) who learned fabulousness from his mother, Muvv (Bette Midler). However, when he's shipped off to live with his conservative father (Larry Pine), Billy's classmates at Ulysses S. Grant Academy don't know what to make of this flamboyant newcomer and his colorful ensembles (with matching makeup). After being severely bullied, Billy bounces back with the help of his new friends, sensitive jock Flip (Ian Nelson and BlahBlahBlah (AnnaSophia Robb). Eventually, he decides to run for homecoming queen, even if that means facing off against the Bible-thumping mean girl Lynette (Abigail Breslin) in this charming coming-of-age story that like Billy is witty and fearless. It is a celebration of the outsider who is within us all. The film looks at the non-ending conflict between free-thinkers and the narrow-minded, between liberals and conservatives and how conservatism seems to have won. Billy thrives in being fabulous yet he does think about toning down his vibrant choice of attire but does not do so and wears the most outlandish and bold outfit possible complete with much eye shadow when he goes to meet his new classmates for the first time. Naturally, he faces much persecution and bullying, and after being viciously attacked and consigned to a coma, he garners the support of the popular football player Flip Kelly (Ian Nelson) who gives him the confidence to run against the ungracious, prejudiced Lynette for Homecoming Queen. Billy runs his campaign on sass alone. I really wish that there was not so much cliché in the film because otherwise I enjoyed every moment. Lawther exudes confidence in the his, and yet we sense his internal vulnerability. Billy Bloom is a role about a teen who is vying to understand his own identity and place in the world and if you say him in the gay themed "Departure", you understand what I mean. His performance is subtle yet profound. The message of the film is that we are all a bit different-each of us have our own quirks and idiosyncrasies, and we should embrace our differences rather than be ashamed of them. It is all about staying loyal to oneself and what one stands for despite being bullying and physically assault. Bullying is still not taken seriously enough in our society: nearly all people have experienced it at some time in their lives, either at work, school, leisure, at home or in the public space. It often leads to violence by the bullied person, or depression and in the worst cases suicide. Therefore this is a good education tool for schools to discuss the theme.